The Betsy Dress for 18 inch dolls is typical of the type of dresses worn by both toddlers and older girls in the 1930s and early 1940s, but depending upon your choice of fabric, the dress can look vintage or modern. Both views in this PDF pattern have a bodice gathered into a yoke at the front, and a skirt made from six main gore panels. The center back gore panel is seamed to allow for the center back closure. View A has a curved shape yoke trimmed with rick rack. It has puffed sleeves with contrast cuffs. The optional contrast peter pan collar adds a touch of charm and the rick rack inserted into the center front skirt panel seams emphasizes the shape of the skirt. An optional ribbon belt with a purchased mini buckle completes the smart look. View B has a gently sloping yoke trimmed with piping. Keyhole sleeves trimmed with contrast binding add a touch of interest to the dress. The piped neckline looks neat and simple and the piping extends down the center back bodice opening. Contrast binding adds a more modern look to the skirt hem finish, and the adorable contrast bow belt just oozes cuteness. - Half a yard of 45” wide fabric or two matching fat quarters for the main fabric. - A quarter of a yard of contrast fabric. - A fat eighth (9” x 22”) of lining fabric (you could use the remainder of the contrast fabric if you prefer). - One purchased package of ½” wide single fold bias binding tape (View B only) or the equivalent in home made bias binding. (Note the ½” is the folded width of the tape). - Half a yard of ½” wide Petersham or grosgrain ribbon and a ⅝” mini buckle for the View A belt. I was to test this dress a couple of years ago, but things prevented me from getting it finished in time. I've just finished making it, and sure wish I had done it sooner, so I could have enjoyed it before. It is one of my two favorite patterns for these dolls. The keyhole sleeve looked challenging, but was so simple with the instructions. Love this dress! The 1930's Betsy dress came out really nice. I made it for my mom who turned 93 in July. 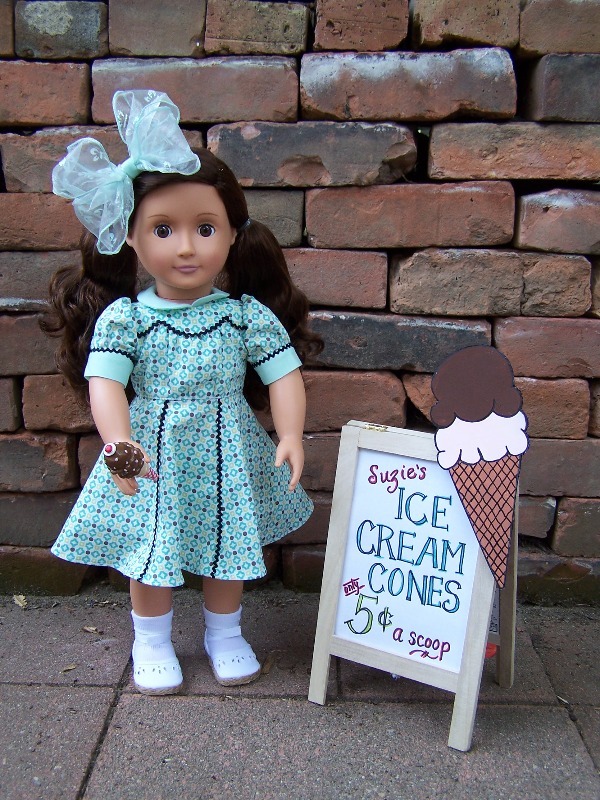 She would have been 10 years old in the 1930's, so I made up an 18" doll representing her having an ice cream cone at her dad's ice cream shop way back then. The pattern bodice was a little tricky because of the gather's that go into the front yoke, but with patience and stitching the yoke and rickrack on top, instead of inserting into the seams, it went smoother. Once the bodice was done, the skirt was a breeze. Again, I stitched the rickrack on top of the seams. The hardest part was finding an appropriate print to represent the 1930's.